For a beginning freelance writer, it can be tough to know where to start, how to get your name out there, and the different avenues you can take in the world of freelance writing. Luckily, with this book, you will be able to spring into action in no time. Caleb Krieger, a veteran freelance writer, gets you going by sharing many details about the freelance writing business and creates an action plan to get you started quickly. This is the introduction to the book, so you are starting right from the beginning. Hopefully you will enjoy this sample and want to dive into the world of freelance writing. Believe it or not, there has never been a better time to break into freelance writing online. The demand for decent native English writers has never been higher – and you don’t need a PhD or even a college education to jump into the market. To many people, the idea of working for themselves and making a full time living by writing online might seem mysterious, difficult, or far away. The fact is none of these descriptions have to be true. This guide will help show you how many amazing opportunities you have to make a full time living as a freelance writer from the comfort of your own home, and just how quickly your life can change once you commit yourself to this path. The rapid rise of technology, especially that of the Internet, has led to incredible changes over the past decade or so. While many may mourn how print markets are “dying” or how things are changing – online freelance writing gives more opportunities than ever before. If you can write at even a consistent junior high level of American English and are willing to put in the effort to find work then you might be amazed how quickly you can build a successful freelance writing business. Now I’m not going to lie to you – it will take work and in the beginning you could be working a lot more than 40 hours a week to get going. But once you put in that work, it can keep paying off again and again down the line. Think of how your life would change if you could make thousands and thousands of dollars a month from home… or from anywhere you had an Internet connection. The travel and lifestyle possibilities you would have can boggle the mind. This isn’t a faraway dream… it’s a business reality that YOU can create for yourself. There are a lot of books and e-books online promising how to teach you to make money freelancing online, but you’ll find a lot of them are heavy on fluff and generalizations and weak on the actual meat. You’ll find that this book does NOT fall into that category because I have created it to be as useful as possible for all levels of beginning writers. So, what will set this book apart from all the other books or online courses you have purchased that just haven’t delivered? Quite a bit, actually. One of the first things you might notice is that this particular book is much shorter than many other freelancing books out there. Why is this? The reasons are simple. I don’t believe in excess words and useless fluff. I’m not here to give you 5 pages of good information wrapped up in 95 pages of useless generalizations. I want everything I write to be useful, informative and most importantly actionable. You should be able to read any page of this book and immediately have information you can put into ACTION to get your freelance writing career launching off the ground. Most people want the income and freedom that comes from an online freelance writing career, they may even take the steps to read some books on the subject, but too many times they will not take the necessary action needed to make this a career. The philosophy behind Bootcamp Books is that you are in basic training. My goal, as your instructor, is to equip you with the necessary tools so that when you are on the battlefield, you will know what to do. Often times, people make the mistake of becoming lifelong learners of a subject. While continuing to learn a business or a skill is definitely an important piece of the puzzle, at some point you need to graduate your training and start implementing the training by taking action in the real world. One of the first things that needs to be emphasized is the importance of taking action. If you ask successful and established freelance writers what their best advice for beginners is, you’ll hear some version of the same answer come up again and again: “Don’t hesitate – just get started.” This cannot be emphasized enough. It’s not even a side note, it’s the single most important piece of advice you can follow to make money freelance writing online. Seriously, get started now! Take action! Like in so many other businesses, there is a process of learning the ins and outs of freelance writing online as well as discovering what works best for you. This type of information cannot be taught to you in a book; sometimes, it can only come from experience. Everybody is going to make mistakes and whenever you try something new (like online freelance writing) you are going to make some mistakes along the way and you will have growing pains. This is actually great news! Don’t be discouraged by mistakes – embrace them as the learning experiences that they are. The more mistakes you have, the better you will get at giving customers what they want the first time, delivering work that gets you raises and that builds your reputation and the better you will become as a writer and freelance writing business owner. The sooner you start, the sooner you’ll grow. This book is designed to guide you to creating a strong and sustainable online freelance writing income as quickly as possible. The information I give you is as brief as possible, geared towards direct action and designed to get you moving as quickly as possible to help you establish your own online freelance writing career. So grab a cup of coffee or your favorite drink and let’s get moving with the first steps towards your new career and the new life it can bring! I read this Hook (an ebook excerpt/sample) and found it very interesting, thought it might be something for you. 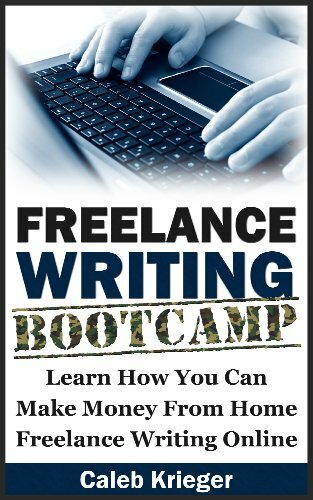 The book is called Freelance Writing Bootcamp and the excerpt is located at http://ebookshabit.com/hooks/freelance-writing-bootcamp-by-caleb-krieger/.